To help you through this weekend’s likely bout of Lent Madness Withdrawal, the Supreme Executive Committee wishes to offer menu suggestions for Palm Sunday. We hope this will also aid in your discernment as to which of the Faithful Four you will seek to propel into the championship battle on Spy Wednesday. 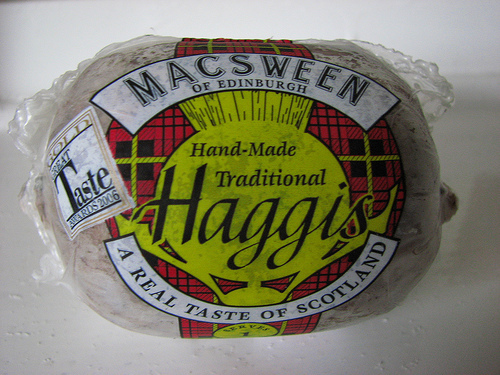 Flickr user Meri Tosh gives us this picture of the classic Scottish food, haggis. Of course, whether it is food is debatable, but that’s not our purpose here. Because the SEC seeks to be inclusive, we note (with some wariness) that there is something called “vegetarian haggis” too. Finding food to represent Mary Magdalene was tricky. The one time in scripture we know she showed up for dinner, she brought ointment in an alabaster jar (or so Pope Gregory the Great said, referring to Luke 7:37). That seemed like a lousy choice for an illustration, so we combed through tradition. She is said to have confronted the Emperor Tiberius to tell him of Christ’s resurrection whilst holding an egg. The emperor laughed and said that Christ’s resurrection was as likely as that plain white egg turning red. Well, guess what happened? 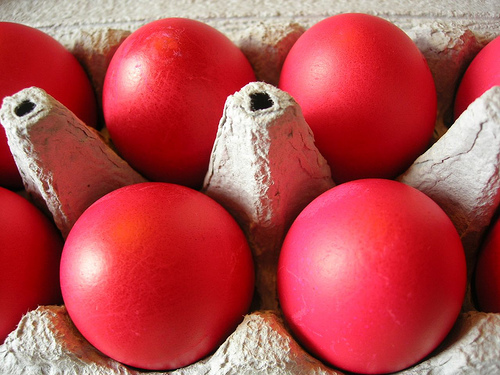 So here we portray Mary’s red eggs (thanks to Flickr user jessmonster). On Tuesday morning, Emma of Hawaii is up against Dietrich Bonhoeffer. The action begins promptly at 8 a.m. Eastern time. People will argue about the quintessential German food. 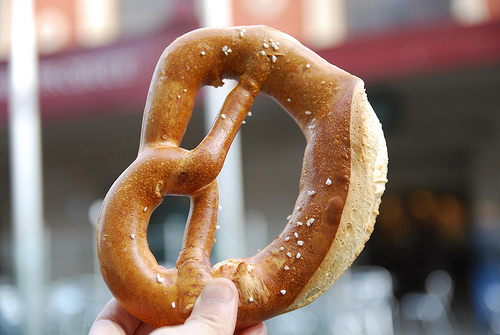 Here we shall go with the classic pretzel as portrayed by Flickr user avlxyz. Finally, a photo which shows the ubiquity of Hawaiian influence on pan-Asian cuisine. A few years ago, I snapped this photo in Tokyo. Yes, that’s a Hawaiian food truck. In Tokyo. So there you have it. Tomorrow after church, have a meal with eggs, haggis, pretzels, and perhaps some fruit. As you say grace, ask God to inspire you through dining. Be known to us, Lent Madness, in the breaking of the pretzel, the cracking of the eggs, the slicing of the haggis, and the peeling of the pineapple. 28 Comments to "Foods of the Faithful Four"
The SEC is simply amazing as you go out there on the edge a little more with each pronouncement. I am quite admiring at your ability to get off that edge and return to normalcy on your own each time. I’m also impressed with your efforts to calm down some of the commenters who seem to be rather thin-skinned in taking offense at each little comment by practically anybody. Bless you two as you try to remind them…”It’s a game !” On to Monday and I have no intention of eating any of that strange food. I’m from the South…..Y’all…alla ‘y’all. Well, I don’t think any of the faithful four were likely to indulge in white bread and mayonnaise [let the reader supply the Southern accent]. Hey, look, I just repeat what the experts say. In this case, the self-appointed Mary-ologist was Pope Gregory the Great. Nevertheless, your point is well taken, and I have updated the blog post accordingly. But seriously. No one objected to the egg story. but some guests shuddered, “Ugh! Thanks for updating the erroneous information about MM. One of the chronically cranky! Well, in fairness, I don’t think it’s possible to say with certainty that Luke 7:37 does not, in fact, refer to Mary Mag. Thanks for your careful attention to Lent Madness! I’ll grant that we can’t be certain, but it requires such a convoluted set of assumptions that Occam wouldn’t fall for it! If applying Occam to this single issue, shouldn’t his razor be consistently applied to every biblical story or miracle? Surely, this leads us to debating how many angels can dance on the head of a pin. That is an urban myth. No Medieval philosopher ever commented on how many angels could dance (or do anything else) on the head of a pin. But should one let the truth get in the way of a good story? Perhaps not always. The SEC is amazing indeed. Thank you for making my day every day this Lenten season! I just regret not getting in from the start. I have so enjoyed reading all the commentary. Next year I will certainly know one of the things I intend to do for lent. Ha. Thank-you for the opportunity to be a bystander in all this. It has had, and I suspect will continue to have, an impact on so many. very interesting, good job! Thanks for LM weekend post. Y’all have an inspirational Holy Week. I have just returned from a screening of the 1928 silent film The Passion of Joan of Arc accompanied the massive Oratorio Voices of Light – Very powerful and it seemed such an appropriate segue into the Faithful Four. It is too bad that Jeanne got paired with MMag so early. Thank you so much for Lent Madness. Lent would have been interminable without it. Is haggis food? I think the pretzels, eggs and Hawaiian food sound fine but I agree with the limerick–UGH. Thanks for Lent Maddness–it has helped me keep my sanity these past forty days. It has been good to have something to laugh about in the midst of much personal difficulty. Tomorrow Palm Sunday–but no donkey, just palm fronds arching over the aisle, a big wooden cross draped with red and jubilation until Eucharist. And then, somber time. The symbols for the coming week are so powerful. I have enjoyed Lent Madness. It has helped to make Lent have a lighter side. Looking forward to seeing who will get the GOLDEN HALO! Still. I’m ready for a hamburger! I have voted in every contest so far, and intend to continue until the end. However, I have yet to see the design for the tattoo I was promised. Nice try SEC but Guy from Food Network’s “Diners, Drive-Ins and Dives” might pointed you in a different direction in Hawaii. Apparently in Hawaii none other than Spam is a big food hit. There are shops in Hawaii that prepare this ubiquitous and possibly meaty concoction in ways that the original creators of the product never dreamed of. Maybe one of the many Hawaiian Lent Madness fans could offer more information or even a restaurant review. Just Google “Hawaiian spam recipes” — you’ll find many great ideas. In the South? Try fried spam on white bread with mayo! I checked it out and found recipes from “Hawaii’s Spam Cookbook” by Ann Kondo Corum. They had everything from spambrosia to upside down spam cake. However if you want these items on a faithful four menu you should probably ditch the haggis in favor of a good single malt scotch perhaps consumed in quantity. 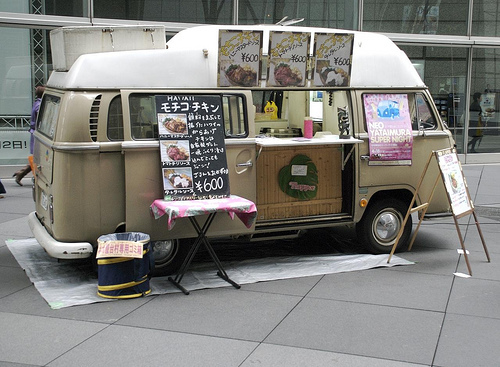 The food truck in Hawaii looks suspiciously like a German-made Volkswagen, which may give Dietrich an unfair advantage in Tuesday’s contest – unless of course the SEC will also supply a photo of someone in lederhosen who is wearing a floral lei. Haggis AND Spam? Now that’ s a Lenten Discipline! And, BTW, I have my mug, but where’s the tattoo? Seriously, LM has been a joyful and much appreciated learning experience. Good work, SEC. May your Holy Week and Easter celebrations be blessed. Do we now have an official Collect for Lent Madness? I just googled haggis…..blecch. how can anyone eat this unholy thing? oh well, upward and onward. Tenebrae on Wednesday. my choir robe is clean, so I’m ready.